Princess is a new addition to our herd and we are very happy to have her. Her father is the famous Peruvian Inca that Jack & Kelly Armstrong owned for many years. Her mother was an original import from the Alianza farm in Peru. Making Princess half Accoyo and half Alianza! 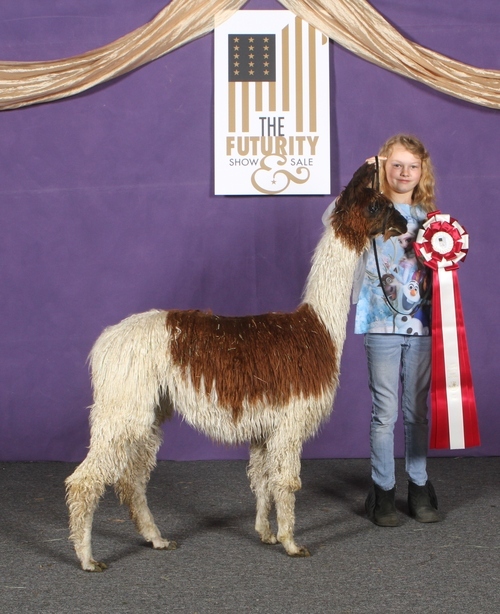 A very collectable alpaca that has shown us she has the ability to let color pass when bred to it! Be on the look out for Princess's 2013 cria, she is a gorgeous light brown and a Mcgyver grand-daughter! Princess delivered the most amazing multi! A GLR Nico girl, whose marking put her in a league of her own!!! We cannot wait to show this girl! She is brown and white with a cute cross on her head! Malificent is an amazing mulit female out of an INCA dam and GLR Nico! Her fleece is super soft and beautifully uniform across the colors on her blanket. We didn't expect a multi out of this pairing but are very happy she arrived as one!